Seeing as we just had Thanksgiving here, I thought I’d pass on a couple recipes from our dinner! This way some of you will have time to check them out before your big November meal!! We made our own cranberry sauce this year! I thought it would be a big deal, but reality was it was totally simple to do! Three ingredients and that’s it! 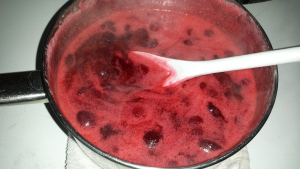 I got the recipe right off the back of the bag of Ocean Spray cranberries, although I modified it a bit. Mix the honey and the water together in a pot until dissolved, heat til boiling. Add the cranberries and boil again. Let them boil for 10 minutes and then remove the pot from heat and let sit until room temperature. Then that’s it! Seriously, I thought it was going to be work, but it was simple! After the mix cooled to poured it into two mason jars, one for Thanksgiving and one for Christmas! (I put that jar in the freezer). Watch it when they are boiling though! The cranberries start popping! Made me jump a few times!